Hudson and Mastonia Black own a very successful horse farm and enjoy an idyllic life. Their life is a true love story and they cherish every moment; until Hudson’s beloved Mastonia falls from her horse while riding. It is the day before they are to celebrate their 40th wedding anniversary. 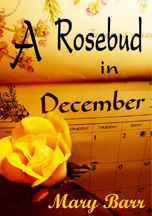 A Rosebud in December follows the unique lives of identical twin girls, Rosemary and Lillibud Waric. No one can tell them apart and no one cares, they share everything and think as one. Overtime, they become simply known Rosebud. Their beginnings are humble; they are dirt poor and live in a trailer park where they are regularly subjected to beatings from their angry, drunken father. Hudson Black ‐ the girls, still living as one, find themselves in a true, life changing, and romantic fairy tale!